I posted this picture on Thursday, wondering what kind of thoughts it would spark and it turns out that Eden Winters had all kinds of ideas! She wrote a little ficlet for us! The little cafe had long been their secret place, a haven where no one judged, no one cared. The burly owner smiled, holding out a hand in greeting. His wife stepped up, an elderly matron with kind eyes. "My boys," she cried, kissing both on the cheek. "Don't my boys look dashing tonight?" she asked her husband when Dirk and Walter stepped further into the establishment, an hour before closing. Few people loitered this close to curfew, and none raised an eyebrow at Dirk, still in dirty, factory worker clothes, walking in with the sleek and polished Walter. They took their normal place in the corner, and Dirk watched the wax from the candle in the center melt and pool onto the scarred wooden table, casting nervous glances occasionally at Walter, who ordered two mugs of beer. A strained smile crossed his handsome face. Do I look now, memorize his face, or do I save myself the pain, knowing how badly seeing him like this, knowing he'll soon leave, will hurt me? Walter's long, graceful fingers reached across the table, beckoning. Dirk folded his fingers to hide dirty nails, placing his rough, callused hand palm down on Walter's. Their fingers laced together. "Everything will be all right," Walter said. "Before you even know I'm gone, I'll be back." Dirk latched onto the words, holding on for all he was worth. Walt had never lied before, so if he said he'd be back, he would, right? "Think of me?" Walter asked, pouring on the charm that had stolen Dirk's heart long ago. His normally seductive smile failed to reach his eyes. "Of course I will," Dirk replied. How can I ever think of anything else? A lights-out siren sounded, causing Dirk to jump. Walter remained stock still, the candle casting shadows across his face as the cafe owner dimmed the lights. They drank their warm beer without speaking, staring at each other from two feet -- and an immeasurable distance -- away. Overhead, the droning of enemy planes caused Dirk to shiver. Again, the reminder of a world gone mad had no effect on the tall, composed Walter. "C'mon," he said, pulling Dirk to his feet. The small cafe where they'd first fallen in love looked far different now than in those hazy, happier days, when they'd nothing better to do than study in the university by day, prowling the bars and cafes late at night until they returned to their shared rooms to make love until dawn. Now, rough-hewn boards shielded the windows, and the once well-stocked bar now sported mostly empty shelves. Even the fine linen tablecloths were gone, taken to a hospital somewhere to be used for bandages. Not just the building appeared different; the lovers, too, had changed. The outset of war pulled them in opposite directions. Dirk toiled from sunup to sundown, building exploding "we will not be defeated" messages for the enemy. Walter delivered them. But there in the semi-darkness, they held each other for what might be their last waltz, remembering those carefree times. Walter hummed a merry tune, once heard on a victrola in this very room. Pulling Dirk close, he swayed from side to side, to the sound of air-raid sirens in the distance. Dirk's tears soaked the insignia of Walter's uniform. "Promise me. Promise me you'll come back to me," he pleaded, hands falling to his sides as his lover withdrew. "I promise," Airman Reynolds declared, brushing his lips softly against Dirk's. "With every ounce of my being, I promise." One more kiss and he was gone, slipping into the shadows and out of Dirk's life. 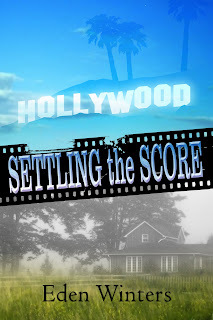 and a fourth novel, Settling the Score, is coming in March! Find out more from Eden herself at her blog, and get any of her stories here. So everyone knows, Thousand Word Thursday pictures will be a regular feature here, and if anyone is moved to write a ficlet about the story and send it to me, I will post it with links and pics for you.